One of the important thing in mapping is doing field survey. Field survey is a method to determine a location in the object such as latitude and longitude coordinates, and collecting various information from the object in field. For example, we are doing survey to determine the point of school in our area and collecting the school information such as name of school, total of student, building level, and the other information we can get from the object. By doing the field survey, we can provide the data and information accurately according the existing conditions in field. 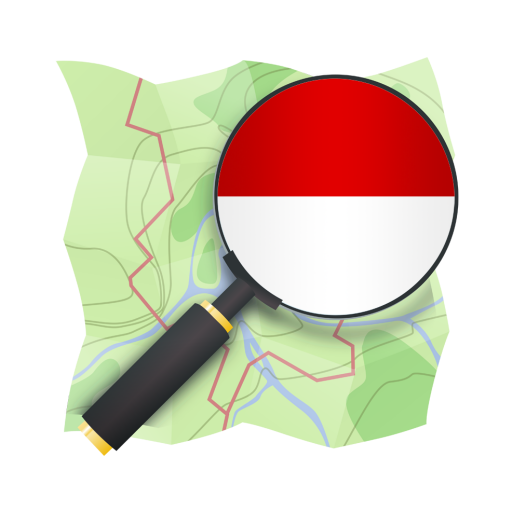 For doing the survey required a tool to assist in the collection of data and information is GPS device and survey paper. Both of these tools we carry during field survey. For helping us in doing the field survey, Humanitarian OpenStreetMap Team Indonesia (HOT ID) launched a mobile application called Geo Data Collect (GDC) (on GitHub). 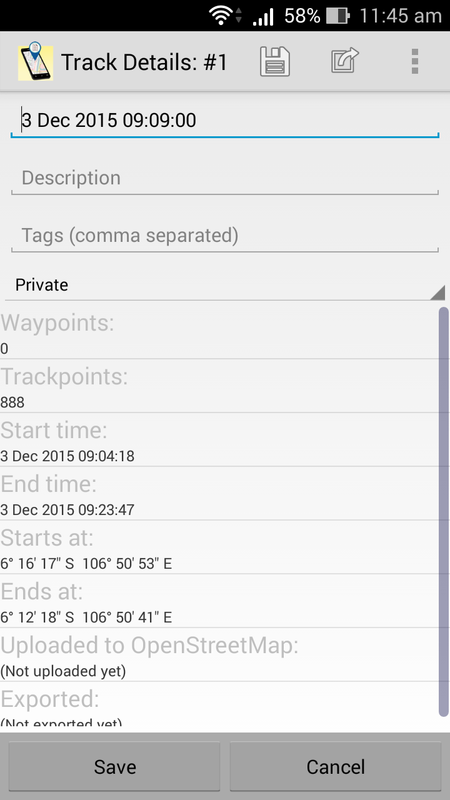 Geo Data Collect is a mobile application used to assist you in doing the field survey. 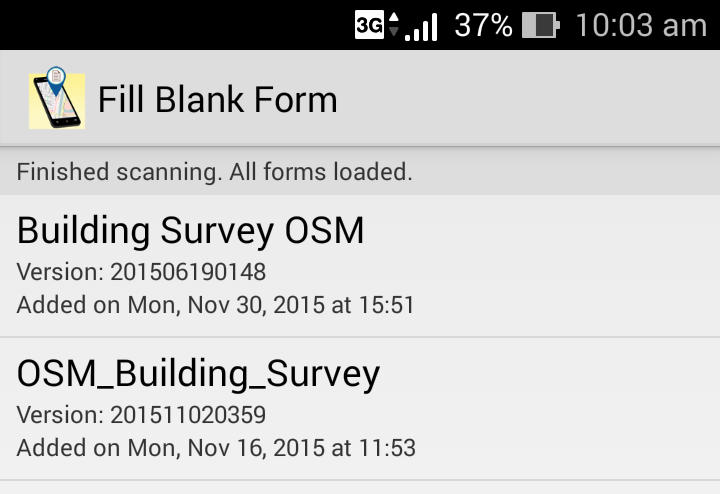 The function of application is combination between GPS with survey paper so that when we want to do a field survey, we do not need to carry the GPS device and survey form but we just need to install this application in smartphone, we can do field survey easily, quickly and accurately. 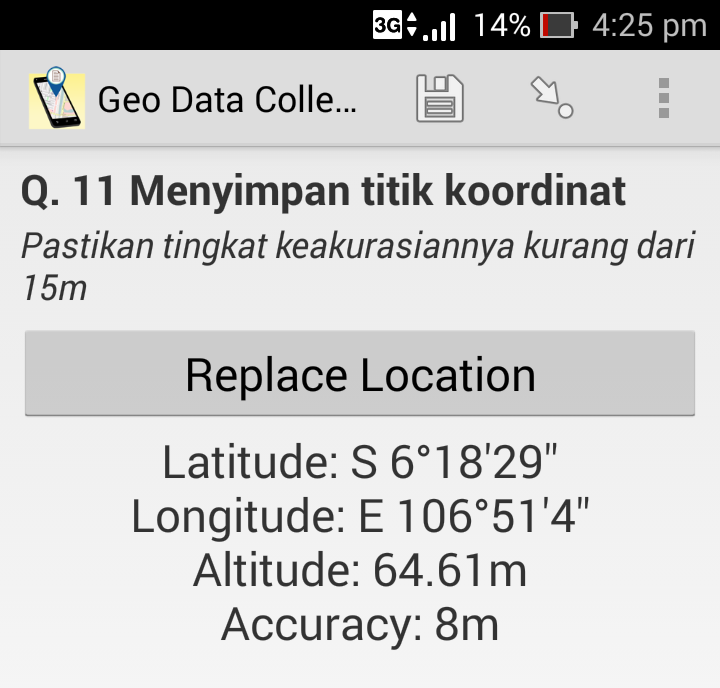 Make sure the Geo Data Collect application has been installed and GPS has been activated in your smartphone. If you do not have this application yet, you can download in Play Store in your smartphone. Then open the application. In the main page, there is the variety of menu such as in the display below. Before you start tracking, we first enter the survey form that we have made into the application by clicking Get Blank Form. For example, we have made tutorial about how to create an online survey form using ona.io website, You can create an online survey form in the other website such as Formhub, KoBo, Enketo, etc. 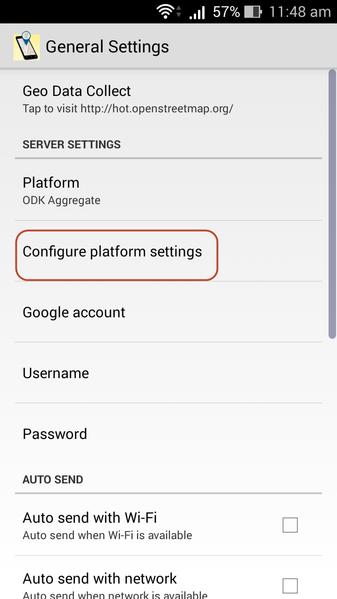 Then click on the top right corner to make the settings, click General Settings, click Configure platform settings and appears ODK Aggregate Settings page. To insert the survey form which we have made previously, click URL menu and insert the URL of survey form in Server URL, for example https://ona.io/adityo, then click OK.
After that, return to the Get Blank Form page, click Refresh and this application will connect to server. Then the name of survey form will appear in the page and check the box. Once the survey form have been entered in the application, it’s time we start a field survey by clicking Start Tracking. If the warning appears “Do you want continue your previous track?”, click Yes to continue the track that exist previously, while click No, Create a New Track to start a new track. 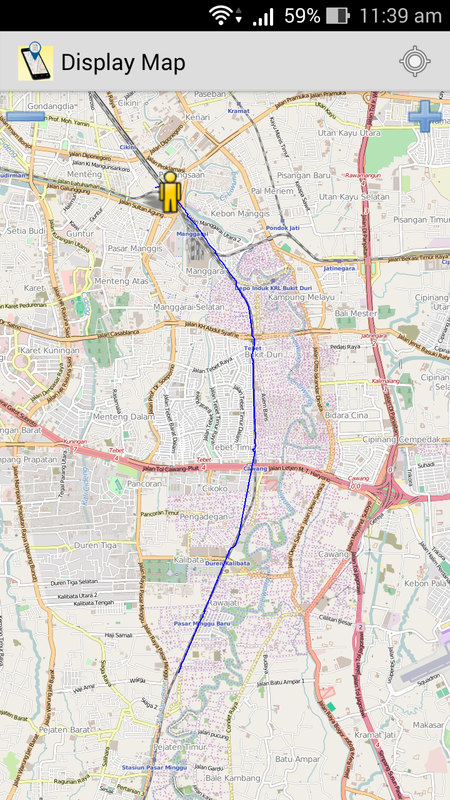 Then appear display map where we can see the current location marked with the yellow symbol. Make sure a GPS signal marked with signal bar in the top right corner marked the green color so that the level of accuracy obtained more accurately. The smaller the number of accuracy then the location obtained more accurately and accordance with the current location. 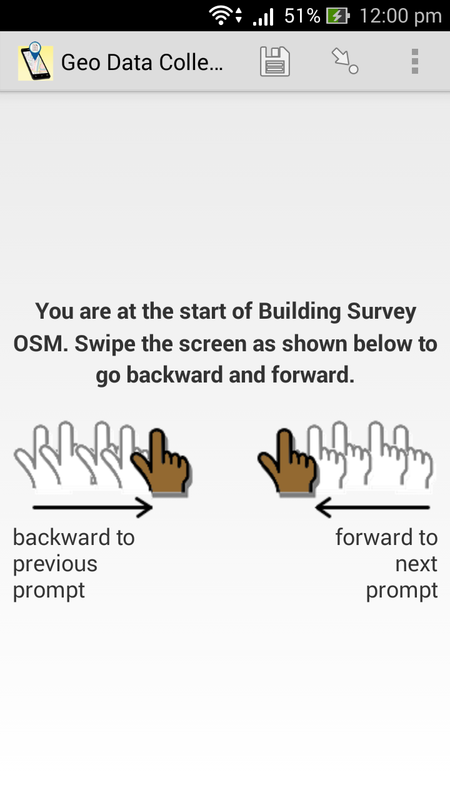 To mark the mapped object and write all information in the object, return to Fill Blank Form menu, then select a survey form which we have been inserted and appear the page as below. Drag the screen to the right to fill a information in an object in survey form, fill information in accordance the survey form which we have created to complete and the information obtained should correspond to those in the current at the time. If you want to return to the previous survey page, drag your screen to the left. After entered to the part of coordinate storage, click Record Location, make sure the level of accuracy less than 15 m, and click Record Location. Then give the name of form, for example: OSM Survey, then check the Mark form as finalized description, and click Save Form and Exit. Do the steps above to mark the next object until all objects have mapped. If the field survey has been completed and all data have been collected, you can click Stop Tracking to disable the recording track. If you want to see the track display when in the field, please you go to the Display Map menu later you will see your track when surveying in the field. Then the object that have been collected can be sent to website where you create the survey form by selecting Send Finalized Form menu, then click Toggle All and click Send Selected. Select the Track List menu, then select the track that you want to save. In the Track Details page, you can change the title, add the descriptions of track and tag. 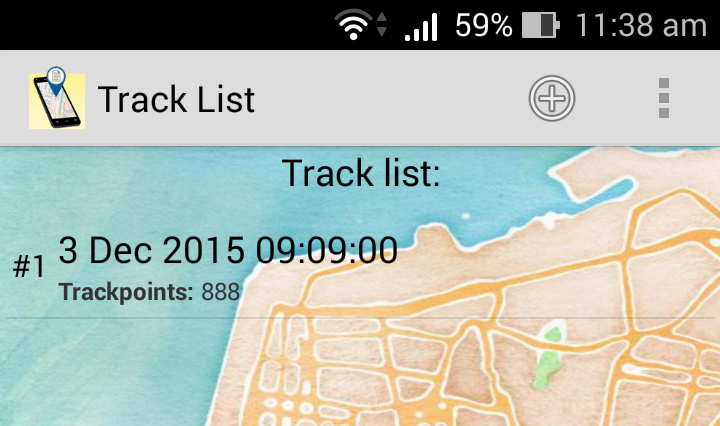 Then you can also select the track status into Public, Private, Trackable, or Identifiable. You can select one of them adapted to your wants and needs if this track want to seen and captured the data by other, you have to select Public status. 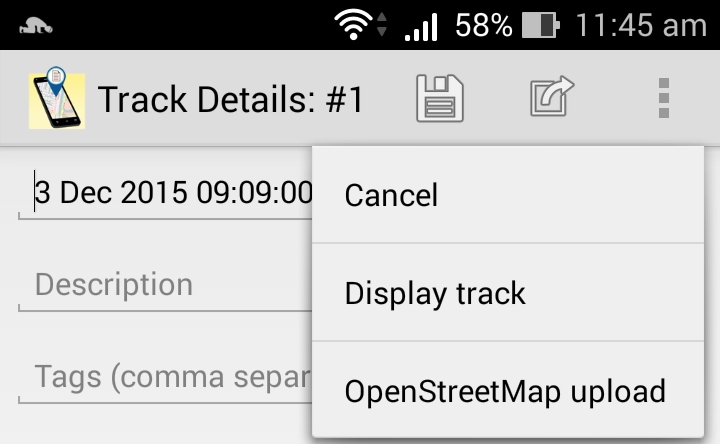 In this application, you can upload the track into OSM server, select menu in the top right corner on Track Details page, then select OpenStreetMap upload. 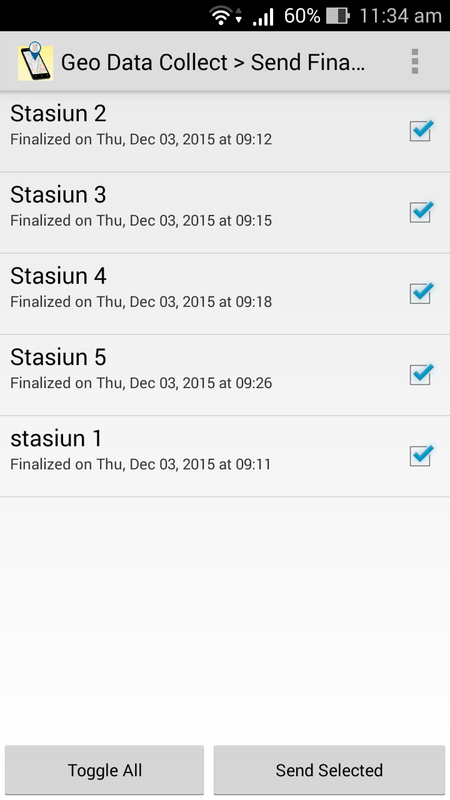 After all the column of title, description, tag, and track status has been filled, please click Save and Upload. After you do field survey by recording your track when survey then you want the track used as reference to do editing in JOSM. Please export your track file into GPX format. 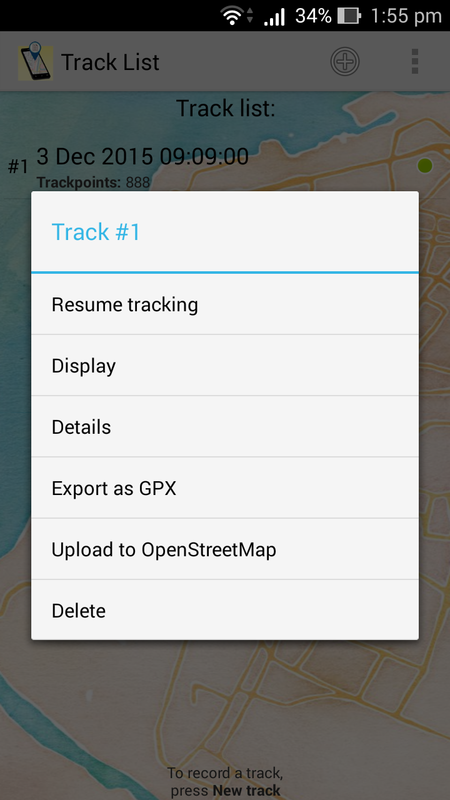 Open the Track List menu then hold few second the track file that you want to export, then it will appear Track menu and select Export as GPX. 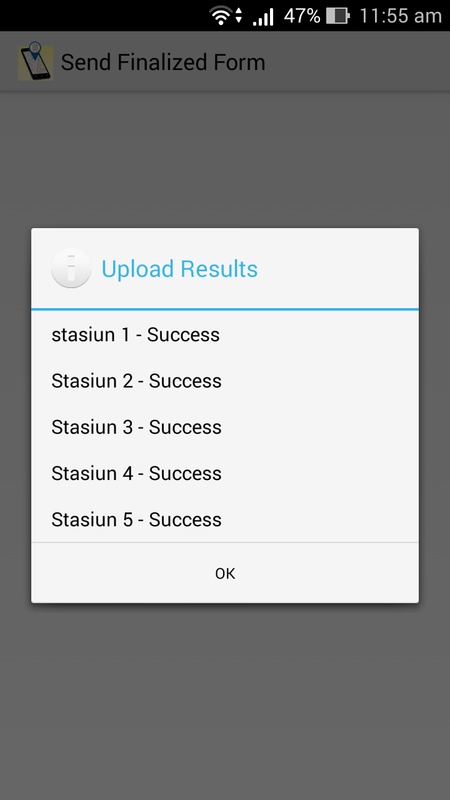 After the track file has been successfully exported, you can get your track file in File Manager on your smartphone. Then the file moved to your computer and open the track file using JOSM. After we collected the data in the field, the next step is getting the survey data result on Geo Data Collect application then input to JOSM. The step in this session devoted to the users who use ona.io website as online questionnaire platform. 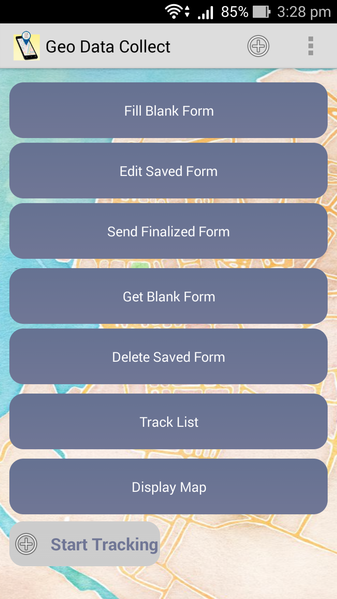 If all data already collected, open Send Finalized Form menu in Geo Data Collect application then select all data that will be exported with click Toggle All and click Send Selected. 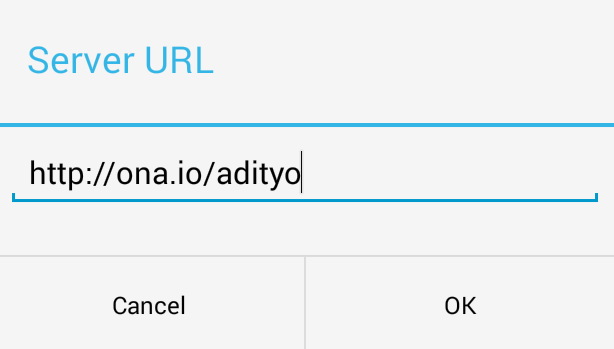 After upload data successful then click OK. All data has been selected will be transfer to the project on your ona.io website. The data already entered into ona.io website, you can see in the part of project you created. Then to export all data, go to Export Data panel then select the type of file you want to export. The type of file that will be exported is a file with CSV format so the file can be read in JOSM then click Prepare CSV Export and click Download CSV. After the file have been downloaded, you can open this file in JOSM but first you have to install the ColumbusCSV plugin in JOSM so the file can be opened and read in JOSM. Then input the file in JOSM with select File menu, select Open and select the CSV file. 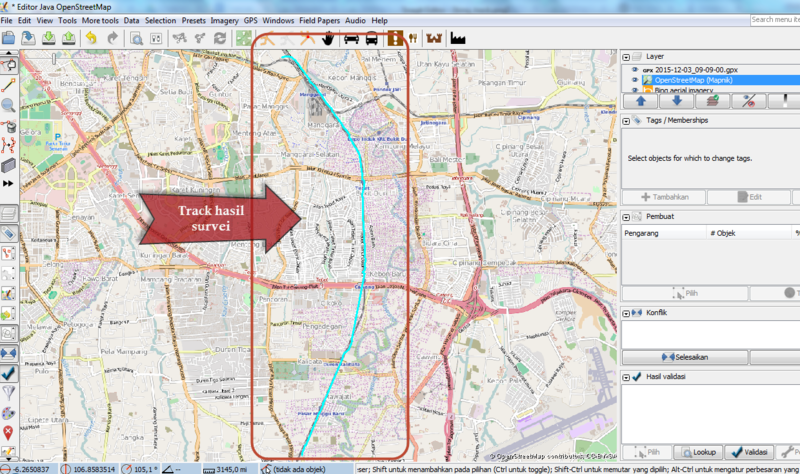 Besides a CSV file, you can also input GPX track file in JOSM. The interface will look like below. The file that we input in CSV format file if we want to upload the file to the OpenStreetMap server, we have to convert the file into .osm format file. 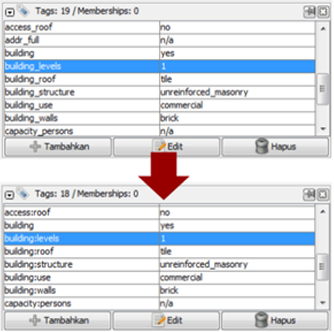 After data has been converted into osm format, the next step was to organize the tag information in the object through the panel of tags in the right side. Change the key and value in the object by default with the key and value in OSM. 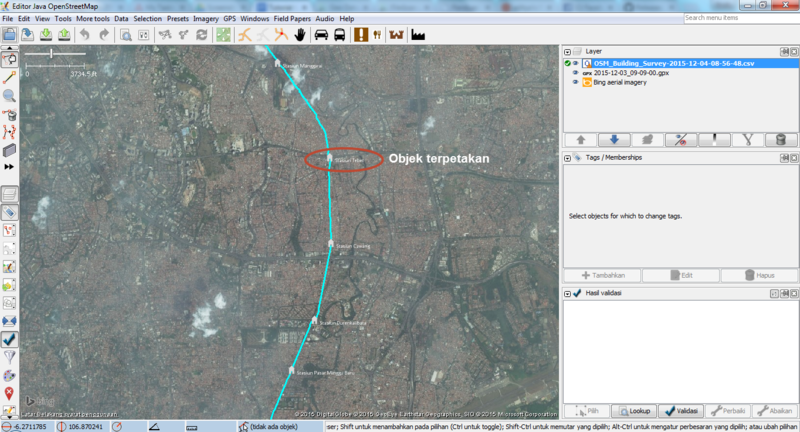 If all data has been organized, you can upload this data to OpenStreetMap.